5 piece shower with diamond tile wall finish, beveled 3/4" threshold, integral wall shelves and center drain. 5 piece shower with diamond tile wall finish, beveled 3/4" threshold, integral wall shelves and end drain. 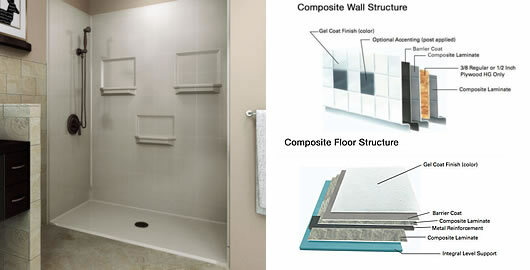 5 piece shower with 4" smooth tile wall finish, beveled 1-1/2" threshold, integral wall shelves, and end drain. 5 piece shower with diamond tile wall finish, 1-3/4" threshold and end drain. 5 piece shower with 4" smooth tile finish, 1-3/4" threshold, flat back wall panel and end drain. 5 piece shower with 4" smooth tile wall finish, beveled 3/4" threshold, integral wall shelves, and end drain.